“But I only buy free-range/cage-free eggs” – a statement we hear often. This is what that typically looks like and know this: no matter what poorly-regulated (or not regulated at all) “humane-washing” label is slapped on your eggs, all the male chicks of egg-laying breeds are ground up alive or suffocated at birth and all these hens will be considered “spent” at only 2 years of age. 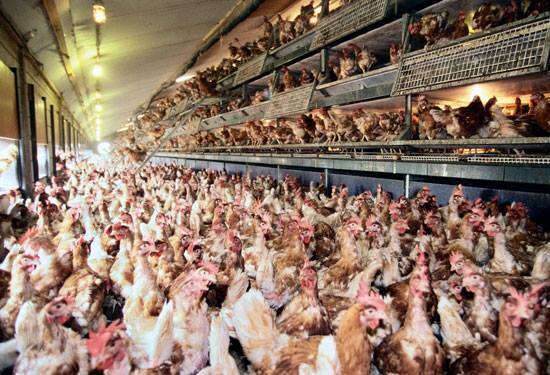 They are then slaughtered for cheap chicken meat and replaced with youngermore productive hens. Most of these hens are also debeaked within days of birth. Does this really seem like a better and kinder choice? And don’t be fooled – Joe Farmer up the road also buys his hens from the same hatcheries that kill all the male chicks. Let’s think critically and compassionately about our food choices and ditch eggs for good.